I sit on the stoop in the courtyard, my feet soaking in the round red basin I bought when I lived in Mexico. I’ve grown lax about my grooming. You would shiver if you saw my toes right now. There are a score of mourning doves on the ground in quiet pursuit of spilled seeds, and the goldfinch are noisy at the tube feeders. I’m reading the book my friend Richard lent me, The True Secret of Writing by Natalie Goldberg. Reading her connects me to the world of writing. It has since the beginning. I used to read Writing Down the Bones and Wild Mind as often as they would have me. Her books make me feel I am part of a community of writers. I write now with my notebook on my thighs, the palo verde sending spotted shade across my forearm. Quiet pride rises in me. Maybe I am learning to stop the autopilot, the not breathing but moving always to the next thing. Can I make my days different even when my work becomes insane again? 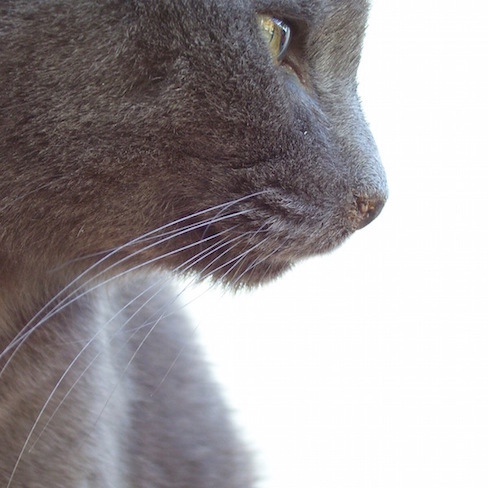 Today I remember twice to get on all fours on the concrete to kiss my black cat. I visit Sofia in the closet. This morning there were six goldfinch perched on the leaning sunflower outside the sliding glass door taking big bites out of the leaves. I watched them from bed and dreamed of a secret zoom lens to photograph them without moving, without making them scatter. I no longer reach for my laptop as soon as I wake up. Yesterday I took a shower before dark and marveled at the view outside the little window, the clouds pinking in the last reflected light, the sun long gone. I kept my eyes on the palm trees, on the sky, while I washed, dusk thickening. Now I perch on the steps in the late afternoon, a glass of lemonade beside me, my feet waiting prunes in the red basin. I hear the visiting cowbird’s song, glance up to see his shiny sleekness at the big tray feeder. His watery trill passes through my skin, chasing peace. I had a funny thing happen with mailing labels, and I want to let it change my life. I wished for more—you know, the free ones wildlife organizations send out, pictures of polar bears and eagles. I was almost out, and I was thinking about that one afternoon walking back from the mailbox, hoping more would come. Within two weeks I must have had eight or nine sheets, more than I’ve ever had at one time. I’ve always had a funny thing about visualizing, too. It isn’t easy for me, unless I’m imagining the things I don’t want to happen. Those spring to life with gruesome ease and require regular banishment. I’ve never been sure, but I suspect I try too hard when I’m asked to visualize something, or maybe I’m afraid I won’t be able to picture it, so I block the image from forming. But these mailing labels were easy, quick, almost unintentional. And not only was picturing them arriving in the mail effortless, but I was not attached to receiving them. I’m certain that was key here, the secret to my largesse. I have tried to visualize winning writing contests, but I don’t know how to be matter of fact about them. I don’t know how to not be attached to my hope of winning. But these mailing labels have inspired me to work in this direction. I am picturing more house finch in our yard, maybe twenty or thirty at the small tray feeder. I am seeing myself thinner and stronger and thriving. And while I was grading a discussion task the other day I went looking for my own “aha” to share with my students and read we should think about how we will feel when we get to have what we want. I like this idea. I think it may help me find a way to “enter in,” that focusing on the feelings may let the pictures arrive unforced. So I am thinking now about how it will feel to have that happy chatter in the mornings from the house finch, joyful and thankful for their company. I am thinking now about how it will feel to have lost more weight, to be healthy and vigorous again, the sheer pleasure and the ease of it, that vibrancy of life. And I am thinking now about how I will feel when I hold a copy of my first book. I can see myself sitting on the patio, eyes closed, stroking the cover. I feel childlike awe, an Easter egg between my open palms, thrilled disbelief, deep gratitude. I feel like the luckiest woman in the world. I am determined to stay current with my blog this year, so I will post today no matter what. Even if what I post is terrible. Natalie Goldberg does tell us we need to be willing to write the worst crap in the United States, yes? Or in the universe. Though I don’t believe she means we need to be willing to publish the worst crap in the world. Only that we need to not be afraid to write badly. We need to not be afraid of our thoughts, afraid of ourselves. We need to be willing to put everything down on the page—no holds barred. Still, after the act of writing we get to choose. Do I really want Uncle Horace to know this about me? What about the people I work with? Do I really want to publish this even though it seems clunky and unpolished? Am I really willing to be that honest, show that much of myself to the world? It is a choice we face again and again, like deciding not to light that cigarette, not to cheat on our husbands. But unlike failing at quitting smoking, unlike making that decision to light up, choosing to edit out parts of our story doesn’t have to be a bad thing. Right? Each time we send something we’ve written out into the world, we decide how much we want to risk, how vulnerable we want to make ourselves. We get to keep ourselves safe. And I think that’s a good thing. (I can hear the clamor of this controversy even as I write.) Is it without its own dangers? No. We might end up not being willing to take risks in our writing. We might keep ourselves too safe. But knowing it is our choice what to reveal, when to reveal it—that’s a comfort to me (if also a conundrum). Thank you, writing gods. Thank you for that. And here’s to being willing to risk. Here’s to trusting we can still be safe. One of those recent horoscopes in my daily paper was about trusting my gut. Donna, the clairaudient, told me the same thing. “Trust yourself,” she said. “Don’t second guess yourself.” I thought I did trust myself. But when I read it in the newspaper, it seemed so direct, so simple. The first reaction, the one I feel in my body, that’s what’s true. Go with that. I knew that. But it reinforced what Donna told me, made me think about it again. And when I was floating on my back in the hot mineral water, the wind fierce outside the sheltered pool, it came to me that I wasn’t trusting myself. I had no idea. I’m not sure how this pattern evolved. But I will often have a gut reaction, and the next thing out of my mouth is something like, “Of course, I could be wrong.” I think it may be because often the toughest tests for trusting my instincts involve other people, and I want to be fair. I don’t want to be attached to being right. So I say what I believe, and then I try to give them the benefit of the doubt. But I think what gets put in play is I am doubting myself. And I don’t want to do that anymore. For weeks now many of my horoscopes in the L.A. Times have seemed especially apt, like the one or two lines were written just for me. One of my favorite ones said, “If it makes you want to run away and hide, you should run toward it and wave your arms as the bigger-than-life force you really are.” I love this. I put it into practice right away. Now whenever I see one of the two work colleagues online who make my belly sink, I flap my arms at my laptop screen. It leaves me grinning. And speaking of things that make you want to run away and hide, it came to me the other day that some of the (endless?) fear images my mind seems determined to present to me might not be just autopilot fears but bits of precognition. Sometimes when they arise might I be getting a glimpse of possible futures? And can my prayers or my banishing of them help to manifest a different future? I am sitting naked in Desert Hot Springs. Not sitting about in the center of town, no—in a small, modest resort with natural mineral springs. The warm wind has been whipping about me for hours, loud in the fan palms beside the pool. 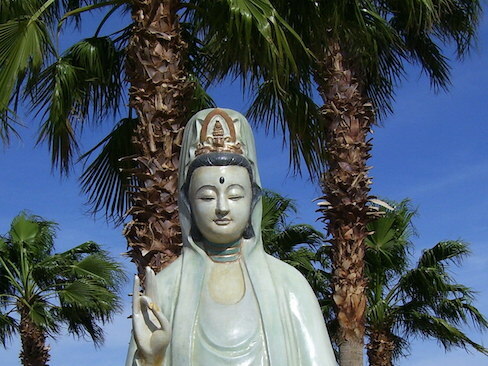 A statue of Quan Yin presides poolside. I’m in the shade now. I’ve been reading most of the day. I go into the hot mineral pool until I’m sated. The wind makes me cold when I emerge, and I wrap myself in my sarong until my skin is dry and the warm air heat seeps into me again. This morning I did yoga. I did qi gong in the early afternoon. I faced northeast, a potted bougainvillea beside me, the low slung hill visible over the bamboo fence. It has been one of those days that go on and on, the quiet stretching of time, summer days in childhood. I feel relaxed, lucky. I am grateful I’ve found this place. My eyes feel sore, a lingering fever. This morning before the wind began, there was a cactus wren laughing from one of these palms. There was a loose dog in the street when I walked here from the bus stop. I look forward to the day when coming here will feel familiar, like visiting someone I know well. I close the door behind me when I leave and walk away. I look back and see the waxing moon hanging above the roofline in the late afternoon sky as though it’s guarding the place. The moon follows me all the way home.